I mean, ‘returned’ in the sense that I can now run 50 min straight pain-free and I’m starting to build up my endurance again. After 6 weeks in the boot and 8 weeks on a return to running program that started very conservatively, I’m so happy to be back at it. As this was my first stress fracture (and hopefully my last), this was all new territory for me. I tried not to have any expectations about what running might feel like or how fast/slow I would be running. I think one of the biggest surprises was that, even after the boot came off for good, I didn’t have much motivation to actually go running. :gasp! : I put my run/walks on my calendar just like I had with my cross-training sessions all summer, but when it came time to actually lace up my shoes and head out the door, I’d kind of stall. I think that happened for a few reasons. First, I was scared. Scared for mostly nonsensical reasons, but the most legitimate being that I thought I’d injure myself again. I think most runners feel this way after any injury, not just stress fractures. Second, running does NOT feel good when you’re not in shape. Seriously, this was a revelation for me. I think we (the Royal ‘we’ of runners) take for granted the periods when we’re in shape and running feels like meditation. Because getting back to running, even in 5 minute segments with a walk break, can be really tough. On one hand you’re so happy to be *able* to run, but sad that it doesn’t feel the way you remember it. It takes patience and time. My first run/walk was 2 x 5 minutes the week of September 28th. I took a few days after my doctor cleared me to just get used to walking around in a PAIR of regular shoes. I’m glad my doctor recommended this to me – even my hips had to get used to walking like a normal person. Running for 10 minutes total had me smiling literally the rest of the day. It was weird and glorious and awkward and amazing. I couldn’t believe how weird running felt on that first run. Within the first minute, I thought, “Does running normally feel like this? Do I pound the ground like this all the time?”. It’s a really disorienting experience when you haven’t done it in awhile. I realized that there’s a reason why so many people say they “gave running a shot once” and didn’t like it! Despite the amount of cross-training I did, returning to running wasn’t as glorious as I thought it would be. But I took it day by day, stuck to the schedule, and tried to stay patient. I really like the plan I followed. I don’t think I would have had much fun trying to run even 1 mile straight the week that I was cleared by my doctor. I’m glad I eased into it and took my time (and that I’m still doing that). The plan started with 1 run, followed by 2 rest days. Then, it was a run every other day. Then it was 2 runs, followed by 1 rest day. You get the idea! Feel free to click on the image for a closer view. All of my runs, so far, have been time-based as opposed to mileage-based. Some days, 35 minutes straight of running would feel effortless and others it felt so.darn.long. And sometimes a 3 hour long run during a marathon training cycle feels worlds away from what I’ve been doing. But I think, ultimately, a time-based schedule forced me to just get out the door and not focus on the mileage — just to get moving was important. I’ve had some really, really great runs too. My first tempo effort was 3 x 5 minutes tempo a few weeks ago (note: I waited 6 weeks until I did anything up tempo.) I was ecstatic when I got home from that run. Tempo pace felt so smooooooooth and my stride felt like it had come back. Each week, I feel like the little pieces are starting to fall into place. My second tempo was 3 x 1 mile and it felt just as great. It’s a good feeling to do 20ish minutes of work! Well, I’m going to slowly build my mileage through December. 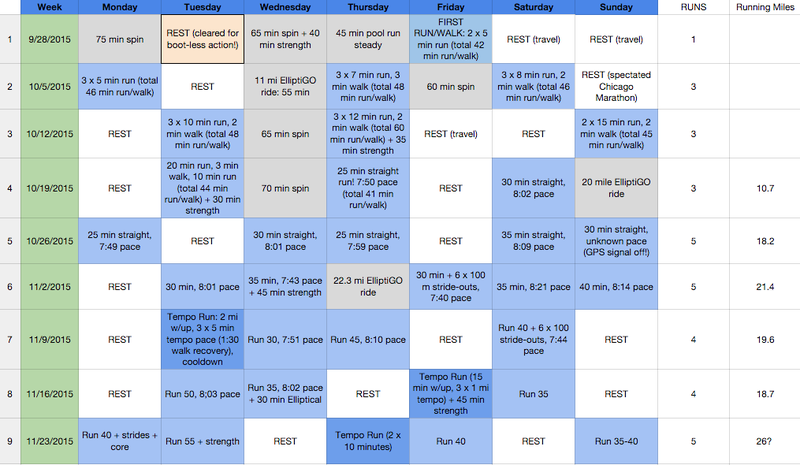 I’ve put a plan together that should help bridge between where I’m at right now (20-25 mpw) and the beginning of a 16-week spring training cycle in January. I’m registered for the Shamrock Half in Virginia Beach and honestly can’t help but think about how much fun that weekend will be with Corey, Liz, and Chanthana. It’s doubtful that I’ll be in shape for a PR in the half by then but I have a feeling it’s going to be a great chance to get to a start line again. It will be my best shot at a good effort before racing the Carmel Marathon near Indianapolis in April. I ran the half at Carmel in 2012 in 1:36:08. [I seriously feel like that was 5-6 years ago…so much seems to have happened!] I’m looking forward to the ‘hometown feel’ of Carmel, just as I did at Monumental 2014. 2015 was a poor year of training and racing for me. Looking forward to a fresh start in 2016! So glad to see you back at it! !